For those considering entering the private jet charter business, there’s enormous value to thinking simply. With the private jet charter industry representing a new frontier in business, there’s a lot of high-brow thinking as businessmen and investors around the world flock to it. With high returns and a certain level of prestige, it’s not hard to see why this is the case. It’s a business that is strongly linked to the rich and famous. And yet, none of that takes away from the importance of keeping things simple when first getting started. Running a private jet charter business can be an incredibly profitable venture. Investing in a fleet, working with high-profile businesses and customers, and having a newfound level of freedom are all incredible draws, but they can mask a simple truth: this is work. Understanding the ins and outs of the industry and doing proper research of the business requirements is a surefire way to get off on the right foot. 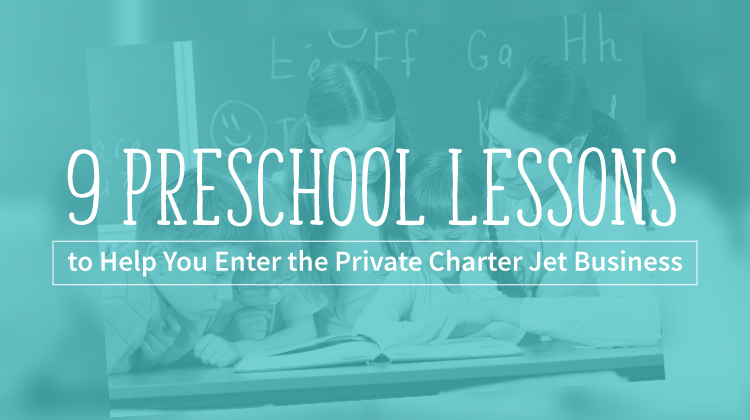 So, to help you with your thinking and research, we’ve laid out 9 preschool lessons that can help establish a solid foundation for anyone looking to get started in the private jet charter industry. 1. All toys are not the same: Toys come in different colors, shapes, and sizes. The toys in this case, private jets, serve a variety of needs, so make sure to consider what problems you’re trying to solve. 2. Big toys are often more expensive: It’s not always the case, but it’s more than likely that the bigger a toy is, the more expensive it’s going to be. The same often goes for jets. 3. Well-crafted toys are expensive: Another thing you probably learned is that quality toys are usually more expensive. The more exquisite the interior design, and the more work put into it, the more expensive the jet is likely to be. 4. Expensive toys need to be maintained: Jets are generally expensive, and like toys, they need to be cleaned and stored safely. 5. Not everyone can have every type of toy: Put simply, the private jet charter business is not for everyone. 6. A broken toy can often be fixed: If a jet has an issue, it can often be repaired. 7. You can buy more toys: You can always acquire more jets to add to your fleet as your private jet charter business booms. 8. Not all broken toys can be repaired: Even though many problems can be fixed, sometimes the best course of action is replacing the jet altogether. 9. Mom and dad can replace a bad toy: In this case, mom and dad are the insurance companies. You pay your premiums for a reason after all!